Sicily villa in Catania area! My house is located in the Aci Castello’s hill, in the village of Ficarazzi that lasts just a km and where you can find everything you need (markets, shops, eateries, pharmacy, ATM, groceries, bakeries …). The villa is fully immersed in a pine forest that is my pride !!! You can walk it enjoying the silence, the mushrooms and the rabbits. My Sicily villa spreads on two levels. On the ground floor we can find: a living room with a glass window facing the pool area and the sea; a fully equipped kitchen; a double bedroom and two bathrooms. Through a wodden staircase you can access the first floor where you can find a big saloon overlooking the living room, and where you can also find a telescope, another of my passions that might allow you to explore al the Ionian coastline. In this level there is a twins, a bathroom, and a suite with a stunning terrace with sea view. All the rooms are bright, spacious and elegant. The outdoor shows a large pool area with a gorgeous and unforgettable view of the Ionian sea. Just outside the kitchen there is a BBQ area. Holidays to Sicily! 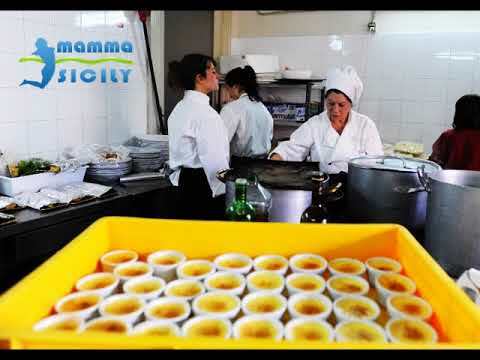 One of the biggest kitchens in Sicily! We are in Ficarazzi, a renowned area of Catania, located above the gorgeous sea villages of Acicastello and Acitrezza. Do not miss our great Etna tour! Catania is5 km's away. I suggest you to park the car in Piazza Alcalà than have a walk: let's start from the worldwide famous Pescheria (outdoor fish market), then to Piazza Duomo (the hearth of Catania) and from it take the Via Etnea, the main street of the town, a pedestrian walking full of shops, cafe and wonderful buldings in Baroque style. Let's walk for about a kilometer, visiting the Roman amphitheatre (in Piazza Stesicoro) until arrive to the Villa Bellini (Catania's public garden). You are very close by two stunning places: Acitrezza and Acicastello (photo, 3 km’s), both fishermen hamlets, where lava flow of millenia ago has modelled the landscape: in Acicastello you can find a stunning castle in lava stone overhanging the sea and in Acitrezza the Faraglioni (sea stacks). Siracusa (Unesco’s), and its Greek masterpieces it’s almost 60 km’s away. In the picture you can see the gorgeous theatre. At a glance: Acireale (Baroque style, 5 km), Savoca (The Godfather movie spot, 40 km), Brucoli (sea village, 40 km), Megara Ibla (archaeology, 50 km), Randazzo (nice town, 40 km), Giardini Naxos (sea, 30 km), Cavagrande del Cassibile (nature, 60 km). Everything about this villa is great. very well equipped, great location and best of all is the wanderful owner Giovanni who will do everything to make sure your vacation is perfect. It was very nice holiday, in a lovely house. The owner is very polite and always help us! We found everything we needed to spend a lovely holiday in villa Tea. We enjoyed the beautiful scenery especially the seaviews. The villa provided us with the necessary comfort like shutters, airco, well-equiped kitchen, linen. It offered a good starting point to visit touristic places in the east of Sicily. The friendly and helpful owner, who lives nearby, gave us a warm welcome. A lovely, large villa with ample living space inside and out, a big pool and wonderful views! The kitchen and outside cooking/bbq area makes self catering a pleasure. The villa has everything you need just like you were at home! All bedrooms have air con which is a Godsend. The local village is within walking distance and has a couple of basic supermarkets, bakeries, butchers and fish shop in addition to pizzerias, spit roast chicken take away, a couple of local bars/ice cream/pastry shops. To venture further afield to larger supermarkets and the nearby coastal towns; which have plenty of restaurants, lidos etc., you need a car - we considered the roads down too dangerous to walk. These towns do get very busy and jammed with cars; parking can be a problem but we found it easier if we got down there before the Italians who arrive a little later around 9 pm! My four friends and I spent a wonderful time in Giovanni's villa in Aci Castello (and Sicily in general) and are more than thankful for the great hospitality and helpfulness we experienced. The big and well equipped house is situated in a walled compound (which made us feel very safe) in the hills and offers a terrific view over the sea. The big pool provides a nice cooling-down at any time and the kitchen as well as a great outside kitchen/barbecue leave nothing to be desired. All things considered, a vacation in Aci Castello is highly recommendable. Great place! We loved it.Highly recommend it.